Spanish intelligence has intercepted messages passed between jihadists online discussing the weaponisation of the deadly Ebola virus for use against the West, while a blackmailer in Prague has threatened to unleash the virus unless the Czech Republic pay him one million bitcoin, a volume of online currency worth over £200 million. The national secretary of state for security in giving evidence to the Spanish Senate revealed online jihad propagandists had issued an edict to followers to kill Westerners by any means possible. Some of the methods suggested included “deadly chemical products from laboratories”, “poisonous injections” and “Ebola as a poisonous weapon”, reports theLocal.es. 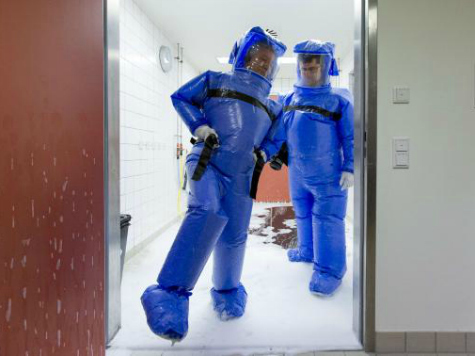 Rumours of Ebola as a weapon have long circulated among the international intelligence community, as speculation arose over the potential successes of the former Soviet Union’s extensive biological weapons programme in the last century. It is thought that at least one terrorist organisation, the Japanese Aum Shinrikyo cult has attempted to cultivate the Ebola for attacks. The cult killed thirteen on the Tokyo subway in 1995 with a release of potent nerve agent Sarin gas. Although Aum Shinriyko and Islamic Fundementalists have an ideological reason for engaging in biological warfare, the communications received by the Czech government last week appear to have been entirely driven by a profit motive. The bitcoin demand, which is worth £210 million in fiat currency terms was demanded in three tranches, one payment on Monday this week, a second on Wednesday, and a third after the blackmailer handed the Ebola material to the government. The deadline has now passed for the payments and the Czech government has no intentions to cave in. Responding to the communication, which stated: “If you don’t answer this letter, we will send press releases to media and inform people on social networks such as Twitter, Facebook and Youtube to let them know how negligent the Czech offices are”, a spokesman for the Czech authorities said the cold weather would probably stop the infection spreading far. Although the demand is being investigated as a blackmail case rather than a terrorist threat, the investigation is being retarded by the highly sophisticated techniques used by the extorter. The bitcoin demand and encrypted message delivered by proxy means the true culprit may not be found. Should they be located, the Daily Mail reports the threats carry a jail sentence of up to 12 years in prison.